Though the first episode is a slow start, 'Disenchantment' shows promise. This is the title of the premiere episode of Matt Groening’s latest animated venture, Disenchantment, which does exactly what it says on the tin. Set in a medieval fantasy world, inhabited by various magical creatures and humans alike, the show sets out to dispel how we typically perceive this genre. Forget the beauty of Middle Earth, this is a world full of drunken gambling, tyrannical kings and time spent in the stocks; disenchanting indeed. Nonetheless, the show is not filled with doom and gloom, of course, for it came from the brain behind The Simpsons and Futurama. In this first episode, we are introduced to our three protagonists: Bean (Abbi Jacobson), the alcoholic, and somewhat reluctant, princess of the kingdom of Dreamland, Elfo (Nat Faxon), an elf looking to escape from the incessant happiness of the elf realm, and Luci (Eric André), Bean’s personal, lifelong demon with whom she is cursed early on in the episode. Being a long-time Simpsons fan, as well as enjoying Futurama every now and again, I had very high hopes for this series, and really wanted to enjoy it. Perhaps this expectation, which I am sure many other viewers shared when they tuned in, is what has made Disenchantment not quite as enchanting as we may have wished. To be fair to Groening, you would expect the first episode of a new TV series to contain a lot of set-up, yet for much of this fairly lengthy 36-minute episode (the average Simpsons episode lasts 22 minutes) the action felt dreadfully slow, with very few laugh-out-loud moments. I didn’t feel particularly compelled to like or root for our heroine, Bean, which is a major red flag. Furthermore, unlike the memorable residents of Springfield, there seemed to be a whole host of characters we are supposed to remember or who hold some significance, and yet I can only recall about five characters in any detail. This is not to say that Disenchantment is wholly unenjoyable. Elfo, in particular, brings most of the first episode’s more notable comic moments, which were genuinely funny. Escaping a land of never-ending happiness in search of miserable reality, the juxtaposition of a recorder-playing little green elf in a hat finding himself caught up in a gory war between some trolls and gnomes is very entertaining indeed. Though there were very few moments where I found myself actually laughing, this episode made for light entertainment, even if it did leave me slightly underwhelmed. Despite these initial qualms, Disenchantment may pick up the pace in later episodes, so I shall continue watching with eager anticipation. After all, this is only the first episode of ten. It is also perhaps slightly unfair to draw direct comparisons to The Simpsons, soon to air its 30th season, since Disenchantment’s premise is so entirely different. 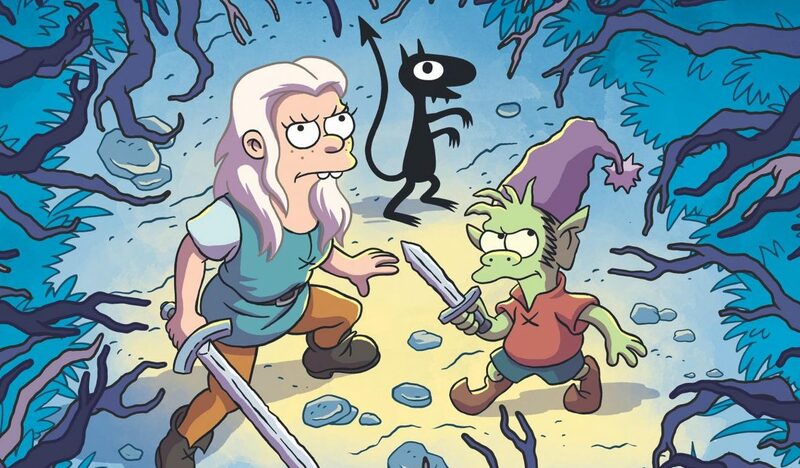 Still, Groening has made quite the name for himself in the animation world, so Disenchantment has quite a way to go to live up to its creator’s legacy. The first series of Disenchantment is now available to stream on Netflix.